I recently dragged my family to Barkerville. You need to go there if for no other reason than to visit a place where your family can spend a couple of days without you hearing those dreadful words: Dad I’m bored. Action – you can have a ride on the top of a real stagecoach. Adventure – you can pan for gold, visist an old cemetery and did I mention the stagecoach? Comedy – the Gold Rush Revue at the Theatre Royal is a great variety show and only one of four shows to choose from. There’s even a bottomless cup of coffee (just ask at C. Strouss & Co.). It’s better than a Harry Potter movie……well it’s cheaper than a Harry Potter movie. Speaking of which (being cheap not Mr. Potter) when you do go make sure to stop and buy your tickets at the Wells information centre. You’ll get a discount on admission and your second day for free. For those of you who haven’t been following my lead up to this trip, Barkerville is an historic townsite that consists of 120+ heritage buildings dating from the 1860’s through the 1930’s. Almost all the buildings have been kitted out with artifacts to show how they would have looked originally. Some you can walk through while others you can only view from the outside. There’s a working blacksmith shop and water wheel. 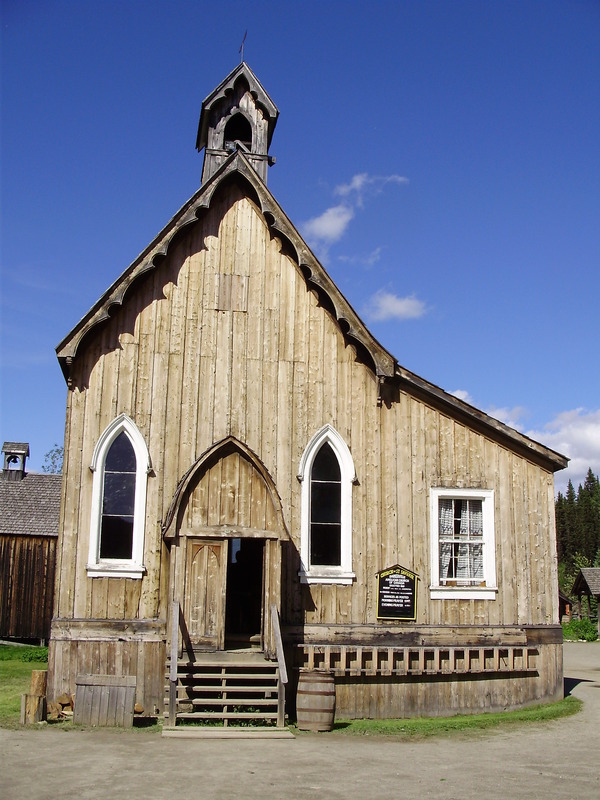 The town boasts the oldest Masonic Lodge in British Columbia. My daughters’ favourite was the schoolhouse where they were treated to an 1860’s style school lesson. As with most historic sites there are living history interpreters milling about in the streets and the shops acting out scenes from the history of the town all day. Even better is the fact that these scenes progress in time as the day progresses. So the tour of the town in the morning is guided by townsfolk from the 1860’s and by the end of the day you are hearing about what Barkerville was like in the 1930’s. My favourite interpretation was the one at the Richfield Courthouse where I was so drawn in by the interpreter that I felt as though I were listening to Judge Matthew Baillie Begbie himself tell us about his life as the first Chief Justice of British Columbia. It was well worth the 1.6 km hike to get there. If you are the type who likes to rough it there are three campgrounds nearby that are more than adequate. The one we stayed in had showers, a playground and a reconstruction of an 1860’s miner’s campsite. One warning though if you are going to camp stock up in Quesnel as it is the closest place with a real grocery store. If you’d rather be catered to there are two B&B’s on Barkerville’s main street. One of them, the St. George Hotel, is in a restored saloon/brothel for that true gold rush experience. Either way Barkerville is well worth the visit. You need to go there. If you’ve already been let me know what you liked most about Barkerville in the comments below. Historic Sites are Great for Family Vacations. I’m afraid I’ve become one of those Dads. You know the type. They think nothing about driving 100km out of their way to take the kids to see the biggest ball of twine in the world. There’s no way I’m going to deviate from a planned route, and I’m not sure even I would find such a ball of twine interesting, but lately I have found myself planning trips around historic sites. The Family and I decided to visit Barkerville this Summer which is a roughly 9+ hour drive. I decided that this was too long to do in one day so we are going to split the trip into two days for ease of travel. What I needed then was somewhere to stop halfway between here and Barkerville for a night. This is where the fly gets into the ointment. I found myself looking for places based on nothing other than what historic sites might be nearby. It didn’t matter whether one campground had free wi-fi or another had showers. I was determined to cram as much history into this trip as possible. Even a decrepid old barn would have sufficed. All of this can be blamed on my daughters. It’s not my fault. Honestly. It all began a couple of years ago when the Family and I went to Fort Langley (an 19th century fur trading post) for something inexpensive to do. K and I were worried that both girls would get bored with such a low-tech outing. The opposite happened in fact. Both girls were enthralled with the old site. We were even treated to a second wedding of sorts as K and I portrayed the happy couple in a traditional 19th century fur trader wedding. M1 still raves about this visit. “Well,” I thought ” if they enjoyed that experience what else would they enjoy?”And so it began. Now every chance I get I try to find some way to worm an historic site into whatever we are doing. My newest idea? An historic geocaching trek for our area that M1 and I are going to do this Summer. Can you have too much history while on vacation?